Can Your Employment Policies Survive the NLRB? Recent statements to the legal industry press by Mark Gaston Pearce, Chairman of the National Labor Relations Board, and NLRB General Counsel Robert Griffin should put all private sector employers on notice that the Board, when given the opportunity to investigate any unfair labor practice charge, will continue in 2014 to scrutinize aggressively employer handbooks and policies for "any" language that might have a possible chilling effect on employees' exercise of the right to engage in "protected concerted activity" under Section 7 of the National Labor Relations Act. Employers almost universally publish and enforce policies to advance the laudable business goals of maintaining civil employee relations, providing information, and fostering productive, profitable, and safe workplaces. The policies promote prompt dispute resolution, prevent bullying and harassment, and protect the company from the dissemination of confidential competitive or sensitive information, whether in the workplace or through social media. No matter, because the NLRB is expansively interpreting what constitutes unlawful "interference" with Section 7 rights and, as noted in a recent article in Employment Law360, finding that many employer policies are unlawful because an employee "might" read policy language and reasonably think that some form of protected concerted activity "might" be restricted. The NLRB construes any ambiguities against the employer, whether or not there is evidence that the policy language, in fact, restricted any employee's actions. Foreshadowing what is likely to be coming in the next few months, Pearce and Griffin recently commented on the Board's decisions involving social media and class action waivers in arbitration policies and agreements, and neither indicated any concern that the Board might be overreaching. In a report in Law360 concerning the NLRB's recent treatment of social media policies, Pearce was quoted as saying that the Board "isn't looking to create new standards when it evaluates cases stemming from postings on social media, but is merely trying to keep its jurisprudence up to date with the evolution of the workplace." But Pearce said he was pleased that the social media cases are drawing attention to the NLRB, especially given that federal courts struck down the NLRB's attempt to require all covered employers to post notices of rights under the NLRA. In a separate report in Bloomberg BNA, Griffin said he is aware of "concerns" that the NLRB is "parsing every provision of an employer's handbook," but he defensively countered that he simply "would like to put an emphasis on some of the 'black letter' principles that clearly define violations of the NLRA but are not understood or followed by many employers." Many employers have been left confused by what they see as the Board's one-sided interpretation of the law and arguably strained, and often wholly out-of-context, "non-real-world" interpretation of employee handbook and policy language. The confusion the NLRB has created is disruptive for employers and their employees. From almost any perspective, the recent comments of Pearce and Griffin demonstrate that the Board's Democrat-Member majority and General Counsel continue to view the "interference" prohibition of the NLRA expansively, and are planning to continue, if not increase, scrutiny of employer policies. The scrutiny will be applied regardless of whether (1) the policies are general, or relate only to social media; and (2) the workforce is union or non-union. Some of the specific types of employer policies that are in the NLRB's target zone are discussed below. In the view of the Board, employees have the right to talk among themselves about almost any employment-related issue and to communicate about such issues with third parties and the general public. Thus, the Board is likely to find that policies and individual confidentiality agreements violate the law if they label as "confidential" personnel information and other information about wages, benefits, or terms and conditions of employment; or prohibit disparagement of the employer, other employees, and management. Likewise, blanket confidentiality policies applicable to internal corporate investigations are likely to be ruled unlawful employer interference. Here, though, the NLRB has made an exception that allows some employer "interference" on a case-by-case basis, when confidentiality of an investigation is reasonably necessary given the circumstances of the investigation. Many employers have policies that require employees to show respect to customers, co-workers, and managers, and to be courteous in their dealings with co-workers, people in the workplace, and third parties when the employees are actually or appear to be representing the employer. For example, it is not unusual for employers to have policies requiring employees to refrain from rudeness, using profanity, or engaging in offensive, intimidating or threatening behavior. Although there is some point at which employee bad behavior is so egregious that it crosses a line even in the view of the NLRB, the line is unclear. Thus, any employee policy or rule intended to track or get close to that line probably will be, at best, ambiguous, and the Board is likely to find that such a rule is overbroad and constitutes unlawful interference. In the NLRB's view, some protected concerted activity might be considered discourteous, disrespectful, offensive, intimidating or threatening – thus, any restriction on that type of activity might constrain employees in the exercise of their Section 7 rights. Indeed, the Board has essentially ruled that some employee annoyance and disturbance is to be expected from protected concerted activity and that employer action to stop it will often be unlawful interference. In other words, the Board has come down squarely on the side of protecting some bullying, harassment, and otherwise uncivil behavior. Policies and agreements targeted by the NLRB include those that prohibit (1) disparaging the employer, management, co-workers, company products, and others, including suppliers and customers, and (2) misuse of the employer entity name and logo or trademarks. In the NLRB's estimation, such policies are overbroad and likely to be deemed to be a form of unlawful interference. Although the Board might allow an employer to prohibit product disparagement and commercial use of company intellectual property, including logos and trademarks, the lines are unclear, and any ambiguity in employer policies will be probably be construed against the employer. Many employers seek to control communications flowing between employees and the media, and have policies that require employees to refer all media inquiries to management, or to a public relations or communications department. The Board is likely to view such a policy as unlawfully interfering with an employee's right to talk to third parties about employer-related issues that are within the scope of protected concerted activity. Policies that prohibit employees from staying on or coming back to the workplace premises during non-working time are likewise viewed by the Board as overbroad and unlawful. In the NLRB's view, employees have the right under Section 7 to remain in employer parking lots and external, non-working areas. Moreover, if the employer lets employees come into the facility for some non-work-related purposes, it must allow access to any employee who wants to engage in protected concerted activity of any sort. This highlights the need for employers to become familiar with the NLRB's rulings on disparate enforcement of policies. For obvious reasons, most employers seek to have some control over communications between the employees and law enforcement or government agency officials. For example, often there is a policy or rule requiring employees to advise management about communications with local or state police, securities regulators, or government inspectors. The Board is likely to consider such a policy as overbroad, because in the Board's view, the policy could be interpreted by employees as preventing them from cooperating with the NLRB, the Equal Employment Opportunity Commission, the Occupational Safety and Health Administration, and the host of other agencies that handle employment matters. The Board treats employee cooperation in such investigations as protected concerted activity. Of course, employer policies on contact with government agencies are almost never intended to discourage these types of contacts. Rather, the policies are intended to ensure that an employee does not inadvertently impair the company's interests in connection with an investigation. The NLRB position, unfortunately, does not recognize this distinction. Encouraged by favorable court decisions, a growing number of employers have policies or use agreements that make arbitration of employee disputes, instead of court litigation, mandatory. Some of these policies and agreements expressly include all employment disputes and fail to create exceptions for NLRB unfair labor practice charges, EEOC charges, or other similar agency charges. They also frequently include an express waiver of the employee's right to proceed collectively or on a class or group basis in arbitration, or they preclude the arbitrator from considering a dispute on a class, collective, or group basis. The NLRB views any arbitration policy or agreement that fails to clearly and expressly make an exception for NLRB charges to be overbroad and thus unlawful interference. (NOTE: the NLRB takes the same view of "open-door" or other dispute resolution procedures that require disputes to "first" be brought to the employer rather than third parties, such a unions, other workers, or agencies). Similarly, the Board views an employee's right to pursue a civil action in court on a class or collective basis as a form of protected concerted activity that an employer may not restrain either through policy or individual employee agreement. "Employment-at-will" statements generally provide clearly that there is no contract of employment for a definite term, and that the employment relationship may be terminated by employer or employee for any lawful reason. (In other words, "just cause" is not required for termination.) To prevent the chaos that can result from actual or alleged "side agreements" to the contrary between employees and company representatives, the policies often provide that the "at-will" provision may not be changed. There has never been any indication that such a statement was intended to deter union activity or ever deterred an employee from pursuing Section 7 activity. However, the NLRB in several cases has taken the position that such policies are unlawful because employees might think that seeking union representation (and ultimately a collective bargaining agreement with termination only for "just cause") would be futile. Employers can attempt to counter the NLRB's strained interpretation by amending their policies to say that the "at-will" status of an employee may not be changed "on behalf of the employer" except by means of a writing signed by an employer's agent authorized to make the change. Employers should review their handbooks, policy manuals, social media policies, work rules, plant rules, and individual employee agreements – including confidentiality and non-disclosure agreements – to determine whether the language could be interpreted as interfering with Section 7 activity, or even having a "chilling effect" on such activity. Employers may want to include specific examples and disclaimer language to clarify the type of conduct or activity that is prohibited as well as that which is not. Although this approach has costs, employers may want to consider dispensing with rules that attempt to address all possible "bad conduct" scenarios and instead simply take action to deal with egregious conduct. In connection with the discipline or discharge of an employee, employers should carefully review in advance the potential for an "interference" claim based on disparate enforcement of a policy. There is little doubt that the Board will continue to scrutinize employer policies for interference, and give special attention to policies applicable to social media and protected concerted activity. One result of the Board's current positions is that many non-union employers, who considered themselves immune from NLRB matters, are increasingly finding themselves subject to unfair labor practice proceedings before the agency. 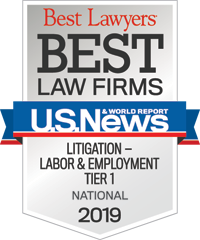 For a "labor audit" of your employment policies, please contact any member of Constangy's Labor Relations Practice Group, or the Constangy attorney of your choice.